Hello Katie Girl: Cyber Monday and Floral Pants that Pop! Cyber Monday and Floral Pants that Pop! More and more, I am gravitating to sumptuous floral prints for winter. I think the trend most likely started a year or two ago with Gucci but now retailers like H&M are doing their own, inexpensive versions of these prints. For example, these floral pants are from H&M and they are a fantastic deal at under $20! I love all of the rich colors and the gorgeous birds featured on the print. Right now, H&M is running a promo for an extra 30% off plus free shipping on your entire purchase for Cyber Monday, so it's a great time to pick them, or anything else, up! Although these pants would look great with just about anything, I tried to add some luxurious details to complement the rich looking pattern on the pants. This "Tilda" blouse with an embellished collar is one of my favorite pieces from J. Crew. I purchased it years ago and it's the perfect accent under sweaters because of its "bedazzled" collar. The good news is that J. Crew released a long sleeve version this winter with the exact same embellished collar! Perhaps I should have picked this piece up during J. Crew's epic 50% off sale for Black Friday, although maybe I still can get it for Cyber Monday! Speaking of Black Friday, Cyber Monday and holiday shopping, it always seems like such a game waiting to see what deals retailers will offer and how to play your cards as to whether or not what you want will even be available once the "big sale" hits. My inbox this weekend was flooded with emails about sales, sale extensions and new sales! I'm waiting to see what will happen tomorrow with Cyber Monday but it's hard to believe that the sales could be any better than they were this weekend. That purse is gorgeous! I love the color of it and how you styled it with your outfit! I also love the little jeweled collar that's showing under the sweater! Perfect colors as always! Your outfits are always so fun to see. 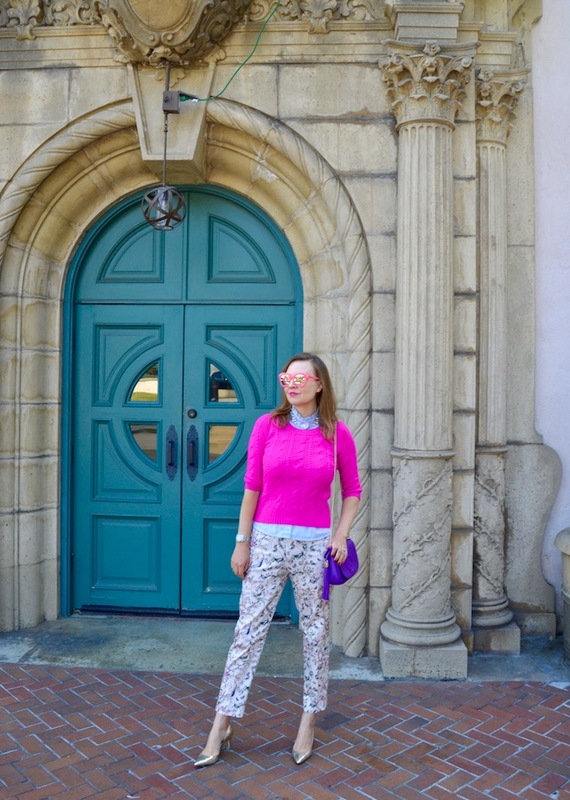 Love the bright pink sweater and those floral pants are definitely show stoppers! I'm totally loving the bedazzled collar! Glad they're back! I'm all about bling! 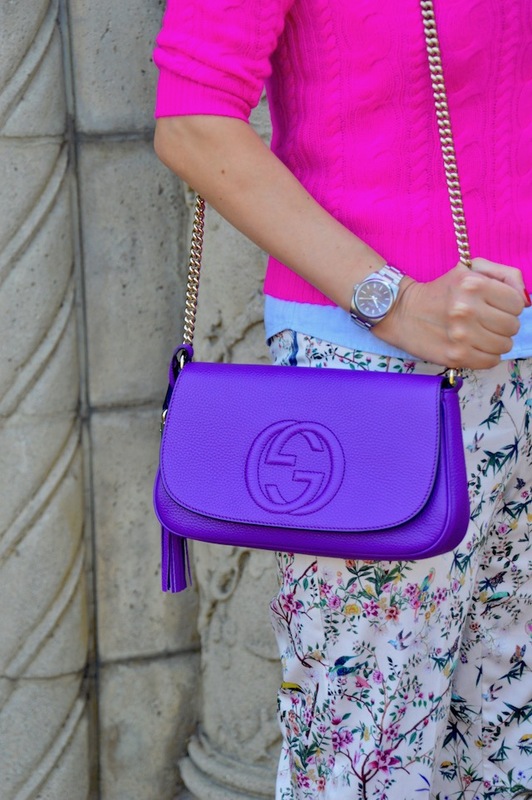 Beautiful bag and so fun to wear it with floral . The necklace is statement too with your shoes 👠. Love it 🥰. Those pants & the colors in your outfit are gorggg!